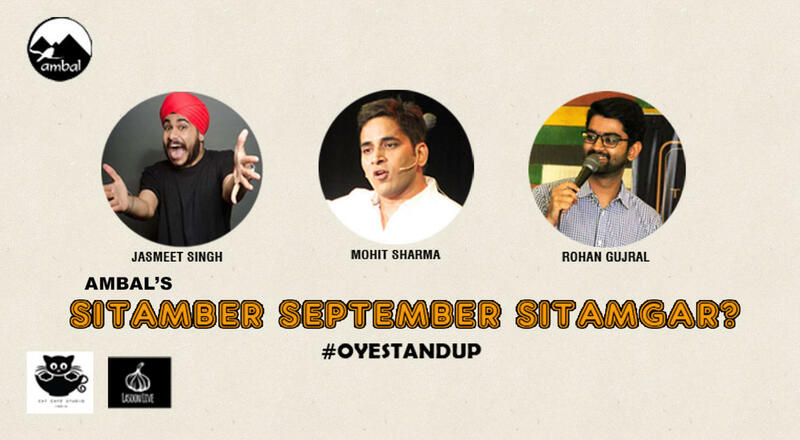 Welcome to Ambal’s #OyeStandUp* curated by Mohit Sharma & Ankita Shrivastav! 88 Shows in 02 years and has been to 06 cities with ek lauta show in Dubai. Showing regularly at The Hive, Canvas Laugh Club & Namma Bengaluru’s Atta Galatta! Maata ka Jaagran would be our next milestone! Hamaare yahan byaah-shaadiyon aur corporate events ke order bhi liye jaate hain! If this sounds like a pitch, then it is! Slice of life stories, Bollywood, Rich values waali gareeb Middle-Class, Festivals & FoodPorn is the circus called #OS. In short if you watch the show you won’t need to watch CID. You still do? Artiste line-ups might change last minute since the number of stand up comedy venues and artistes would soon outnumber the audience! So brainwash your gang as #OS promises to be funny, wicked, mean and yet not offensive; provided you forget your mobile and like this sense of humour!